1. 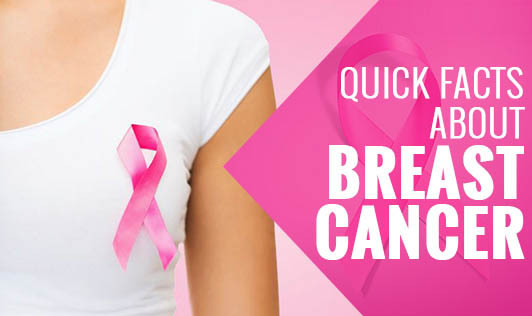 Risks for breast cancer include a person's age, family history, atypical hyperplasia, delaying pregnancy until after age 30 or never becoming pregnant, early menstruation (before age 12), late menopause (after age 55), usage of oral contraceptives for many years. 2. Approximately 1.2 million cases of breast cancer are diagnosed around the world each year. About 75% are found in women over age 50. 3. When breast cancer spreads beyond the breast, it is said to be "metastatic." The most common places breast cancer spreads are the bones, liver, ovaries and lungs. 4. It has been estimated that if every woman over the age of 50 had her yearly mammogram done, breast cancer deaths in this age group would drop by 25% or more. 5. Ninety-six percent of women who find and treat breast cancer early will be cancer-free after five years. 6. There are a number of misconceptions about the cause for breast cancer. These include using deodorants or antiperspirants, wearing underwire bras, having a miscarriage or induced abortion, or bumping/bruising the breast tissue. 7. On an average, mammogram will detect about 80%-90% of breast cancers in women without symptoms. 8. Breastfeeding has consistently been shown to reduce breast cancer-the greater the duration, the greater the benefit. 9. There is a strong correlation between increased weight and breast cancer, especially those who gained weight in adolescence or during menopause. Body fat composition in the upper body also increases the risk. 10. There are research going on to find the link between alcohol consumption, cigarette smoking and breast cancer. 12. The first National Breast Cancer Awareness Month (NBCAM) took place in October 1985. 13. Not all lumps that are found in the breasts are cancerous, but may be a fibrocystic breast condition (disease), which is benign. 14. Estrogen replacement therapy for over 5 years slightly increases breast cancer risk; however the increased risk tends disappear 5-10 years after discontinuing the therapy. 15. Studies show that social isolation and stress can increase the speed at which breast cancer tumors grow in animal models. You are never too young to develop breast cancer! Breast Self-Examination should begin by the age of 20!